Economy is one of the essential fundamental pillars of human civilization and society. Economy is a vertebra of trade, ownership and trust of every government, financial institution, businesses system and their working models not only constrained to conceptual understanding of functioning global economy. Liquidators, merchants, consumers and financial institutions together energize an ecosystem of economy by representing or denominating paper currency – a common, reserved currency that is being used to trade all kinds of goods. In layman terms, digital currency is data represented by unit of bits or bytes. Digital revolution, technology evolution and human perception have introduced digital currency, or cryptocurrency, with an encrypted hashed data that has given a value to be used as a unit of virtual currency called bitcoin (BTC). Bitcoin is used on business transactions among Peer to Peer (P2P), Peer to Business (P2B) and Business to Business (B2B) via miners (blockchains) without a need of traditionally functioning central banks, currency regulatory authorities or government regulations. In its initial stage, bitcoin offered freedom from financial fund mobilization without the need of banks and bandits. For instance, if a trader trades with bitcoin to buy a car, there would be no need for real currency or bank or regulatory involvement. Perhaps minor transaction fees are collected by blockchainers; so in that sense, bitcoin has the same value as gold or paper currency for trading, which is completely virtual. Blockchain is a general public ledger, a shared digital chain of networks, a digital bitcoin community created by distributed miners. The miners are involved during hash generation, data move, monitoring, verification, collection of transaction completion logs and virtual currency storage, and maintaining bitcoin owners' privacy and identification. These distributed blockchains of miners share and update records of bitcoin transactions among all globally-distributed miners. In a nutshell, blockchain facilitates bitcoin trading with minimal charge for each transaction verification, data process and transaction record logging. To run a blockchain, fundamentally, direct costs are involved for computing processing systems and infrastructures, electric power systems and internet bandwidth and capacity. Bitcoin creation is pure mathematical calculation done by networks of computing processors or confined computing processing infrastructure farms to generate a hash value that is impossible to decipher or reverse engineer. A hash (SHA-256) value is a virtual digital bitcoin given a value in numbers. Generating and harvesting bitcoin costs computing farms, processing powers (Application Specific Integrated Circuit) and infrastructures in consumption of electricity power. It depends on the type and quality of computing processors to produce hash numbers per seconds with the amount of electricity power consumption. So hash value is directly propositional to the electricity power being used. However, the hash value is traded much higher than the electricity power investment. So bitcoin mining is equivalent to a printing paper currency. In the future, governments, financial institutions and monetary systems may come together to govern, regulate and monitor mining and bitcoin distributions which would certainly ease transitioning from current financial systems to a completely virtual cryptocurrency. As an example, a PC/laptop user can also be a part of mining networks. Once a hash value is generated, it will be equally distributed among all mining networks’ participants based on the amount of processing power that was used to generate the hash value. 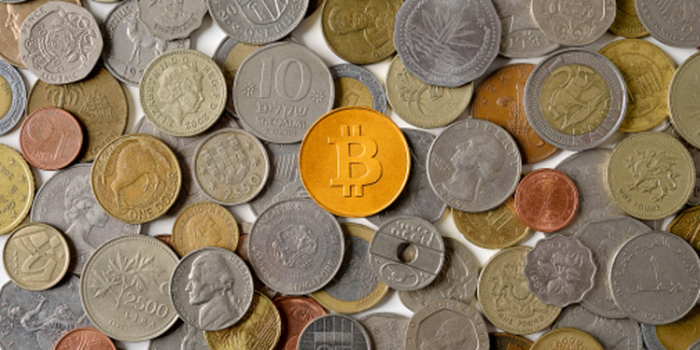 Bitcoin trading is facilitated by various traders. You can learn more at WeUseCoins.com and Bitcoin.org. Trading bitcoins means bitcoins exchange from your digital wallet (a computer or electronic mobile device) to acquire some items or goods, where public and private keys are given to each wallet owner to store hash values. While sending bitcoin, a user needs to sign it with a secret, private key (user account username and password are required to make any transaction with bitcoin), whereas a public key (user account information and a wallet address) is a way to identify a user’s virtual wallet publicly. Liquidators, so-called warehouse suppliers, or some sort of regulated authorities hold and supply the bitcoin per demand. Consumers buy bitcoin from liquidators. Merchants accept bitcoin from consumers in exchange of goods. Blockchain (miners) secure the bitcoin transactions anticipating to collect per transactional charges and also to harvest bitcoin in parallel in use of high-process computing processors and electricity power to produce hash value. Software developers, along with IT technologies, contribute to make the bitcoin trading community more secure and innovative. And increasing bitcoin adoption helps Internet of Things (IoT) community intelligence bonding. Financial institutionalization is expected from Wall Street (perhaps Wall Street creates a common protocol on bitcoin trading among financial institutions, governments and monetary regulations as an outcome to facilitate a bitcoin trading platform). And finally, bitcoin being a reserved currency to trade commodities, stocks and other digital trades. Trading bitcoin is like trading gold via wire! Virtual currency trading is gaining momentum, but has not been approved, regulated and recognized by collective governments or financial institutions yet. Digital community and bitcoin traders are anxiously waiting governments’ and financial institutions’ recognition and adoption of bitcoin as a replacement for real currency. Technically, that day will be an end of a paper currency era that is backed predominantly by gems, gold or silver. Should these metals go down in value? Of course! At least read, research and retrofit yourself with bitcoin technology. Ultimately, it is expected that crypto-digital numbers will be preferable over paper currency – the way email takes over traditional mail systems. The way PayPal, credit cards and wire-transfer are taking over paper currency. The way internet takes over traditional information exchange! Be assured, it is virtually impossible for technology and artificial intelligence that produce a number (crypto) to be controlled entirely by governments and regulators.